In response to a plea from the Minister of Defense, an incredible number of people took to the streets of Cairo on July 26 to show their solidarity against the aggressive and disruptive behavior of the Muslim Brotherhood (MB) protestors. Like they did on June 30, the "Silent Majority"—who usually sit at home and watch political events on their TV screens—voted with their feet, taking to the streets in very large numbers. People went to the demonstration sites from every conceivable place. It was an amazing night of celebration and jubilation, affirming together an Egypt where all are respected as equal citizens. 1. Christians eating with Muslims in public squares during the Ramadan breaking-of-the-fast. 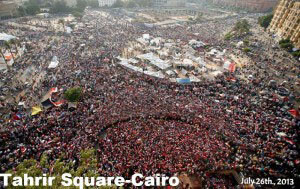 This unprecedented act of unity between Christians and Muslims has never happened on this scale in Egypt. 2. When the call to break the fast was announced at sunset, all church bells in Egypt rang in solidarity with their Muslim compatriots. 3. With an estimated 40 million people on the streets, remarkably few incidents of violence, petty theft, and harassment of women were reported. 4. The euphoria of the people lasted all night as massive crowds again expressed their rejection of the "Political Islam" agenda of the MB. So why are the media giving you a completely different impression of what's happening in Egypt? What you've seen are the "other" demonstrations by ousted MB supporters. For the past month they have been camped on major streets in Cairo and elsewhere to angrily and often violently protest Mohamed Morsi's removal as president. On Jazeera, CNN, and most other Western channels, instead of showing the millions of happy and peaceful demonstrators, the cameras only focus on tens of thousands of angry protestors as well as shocking photos of wounded and dead victims of pro-Morsi demonstrations. While much of what you see in the media is true, it represents a selective perspective of what's really happening. The claim that the MB are "peaceful demonstrators" runs contrary to the violence and brutality we're experiencing on our streets. Anyone with the misfortune of walking or driving close to one of their demonstrations is taking his life in his hands. (Many of my friends have had close calls.) The real nightmare, however, is for those who live close to the sit-ins. They are becoming increasingly angered by the complete disruption of their daily lives. Most Egyptians, despite their disdain for the MB, oppose Egypt turning into a police—or worse, army—state and have been putting much pressure on security forces to be restrained in their response to the MB agitators. Most of us yearn for a civil state run democratically. Many of you have experienced similar sit-ins during the Wall Street demonstrations in the United States and others in London, other European cities, and Turkey. In all these cases, the police used force because the demonstrators were unarmed. In our case, however, it's difficult to use force against people who will retaliate violently. Please pray for the Egyptian leadership as they try to figure out a way to disband the demonstrators without shedding blood. At the Bible Society, we're working hard to produce materials that will help encourage Egyptians to love their fellow citizens even if they disagree with them politically. The widespread hatred against the MB is very worrisome. Please pray for us as we communicate the radical, biblical mandate to "overcome evil with good" (Rom. 12:21) and to love even those we consider our enemies (Matt. 5:44). Are you as surprised as I am at this seemingly credible report? What is the agenda behind Western news agencies showing the violence and upheaval? Is it to paint the Egyptian security forces in a negative light, and to garnish sympathy for the recently ousted Muslim Brotherhood, who still claims that "democracy" is their goal? This article appeared August 5th on the Gospel Coalition website. Isaiah 9:2 "The people who walked in darkness have seen a great light; those who dwelt in a land of deep darkness, on them has light shined."